1. Start Mi Heart Rate app and measure Your heart rate (bpm) for few seconds. 2. Connect to Apple Health app in settings of Mi Heart Rate app. 3. Go to Apple Health App. 4. 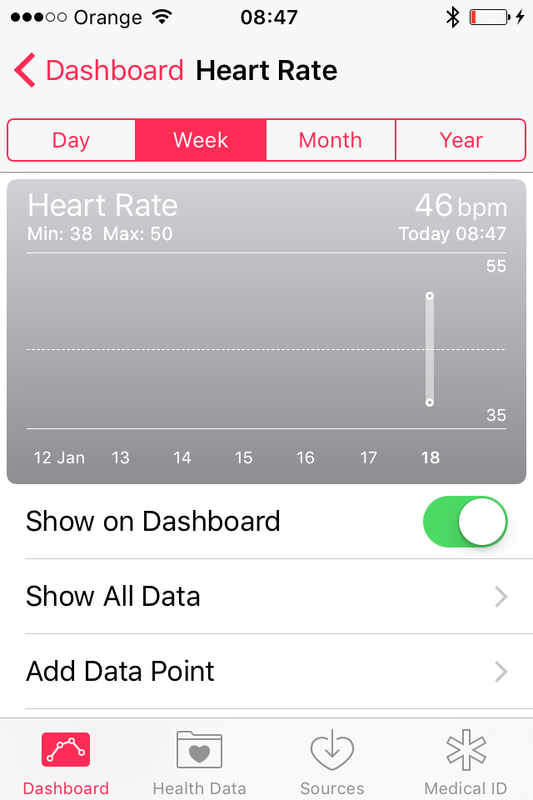 In Sources (Apple Health App) allow HR app to write data on heart rate. 5. 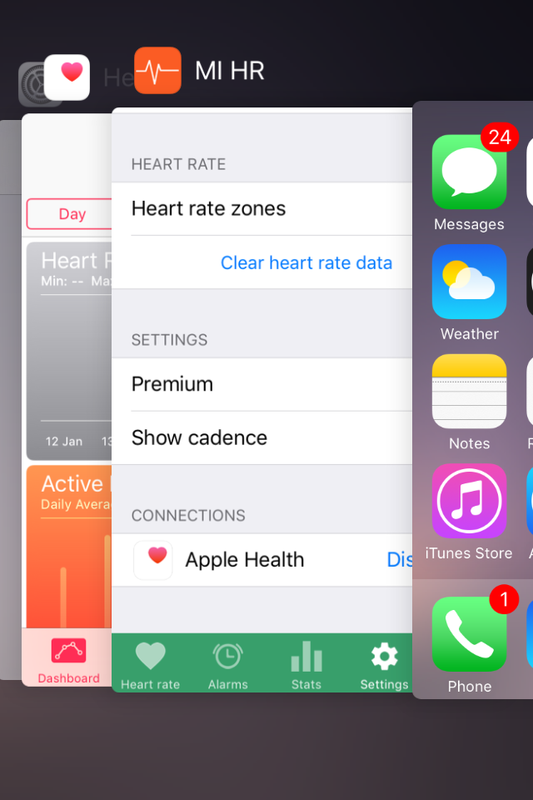 Get Your heart rate data in Apple Health App. You can get Mi Heart Rate app from the Apple Appstore. You do not need official Xiaomi Mi Fit app for this. Enjoy Mi Heart Rate app! Hi. This does not help. There is no MI device shown in the sources section in the Health app. Ah 9.3 – I didn’t test there yet. You are the second person with 9.3 who has issues. Will make 9.3 tests in the upcoming days. Sorry for unconvienance. please shoot me an email hubert@mimhr.com and I will send You my Skype details. We can than chat and solve the issue together. do You have 9.2 or 9.3? Please drop me a line at hubert@mimhr.com and we can try to solve it over Skype. Hi, I’m trying using the app for ios version free . I was able to configure Strava , but I did not succeed with HEALTH IOS . Iphone 6s with ios 9.2.1.
it definatelly should work in Your configuration. I shoot You an email with my Skype details. Let’s try to solve it together. hello, I’m using your app for some time. It’s very good, does what it promises, congratulations for the good work. I’m on iPhone 6 iOS 9.3. Can you give a time frame for when the app will be updated with the new features? In the meantime I am working on the new features which should see the sun in around 2 weeks. I bought you app to measure continually my heart rate, but I have an iPhone 4s running 9.2 iOS, how can I integrante your app with any App that will show heart rate history, I understand apple healt integration only works with iPhone 5s or superior, right? Great!!! works perfectly, iPhone 4s. 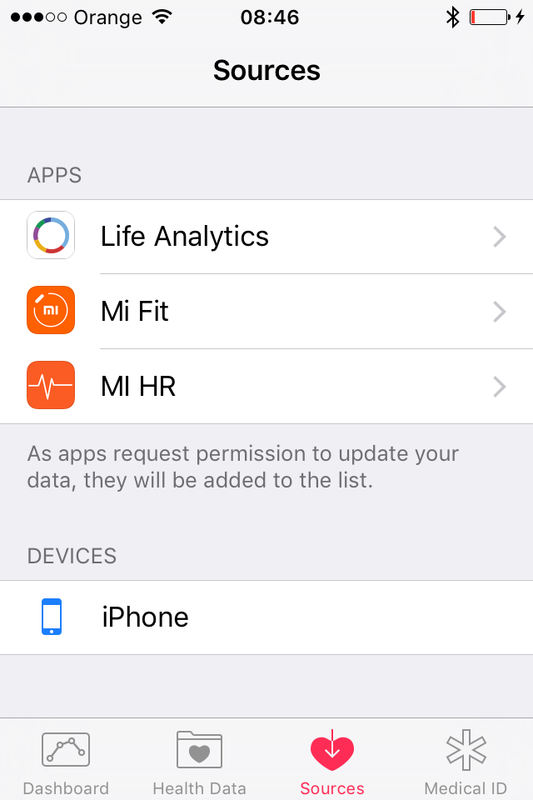 in the application Health App it is necessary to specify the data source mi hr (there are no this option) ? No You don’t have to specify source. Apple Health will catch it by itself. i have The 9.2.1 iPhone 5s but it doesn’t synchronize with health app. did You try to restart iPhone after strictly following mentioned steps? The Xiaomi Mi Band 1S is accurate as any other big-name fitness tracker, does what the competition does, and all for just $15. 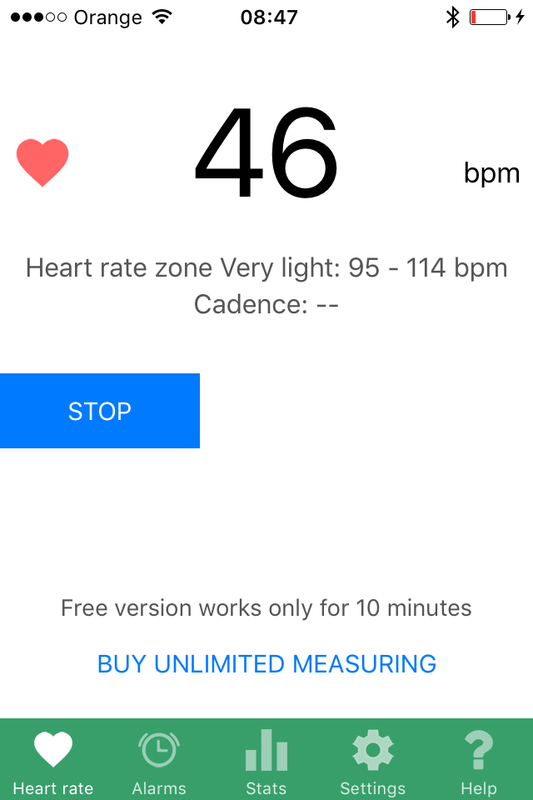 I bought the app to measure continually the HR, but it doesnt work with the Apple health app. I have an iPhone 6s with iOS 9.3.1.
did You try too restart iPhone after strictly following the steps? Can You please contact me at support@mimhr.com so we can try to set up a Skype session to fix that together? I bought your app, but I don’t see Mi HR in the Health’s app sources. I tried to follow the steps – nothing changed. So, now I have not any history of my pulse measure. We already talk about it through the support. Please try to restart the phone after strictly following procedure. And I can add You to the beta testing group. My was with same problem. I had measured a few time using MI Fit App, which history was kept by Apple health. 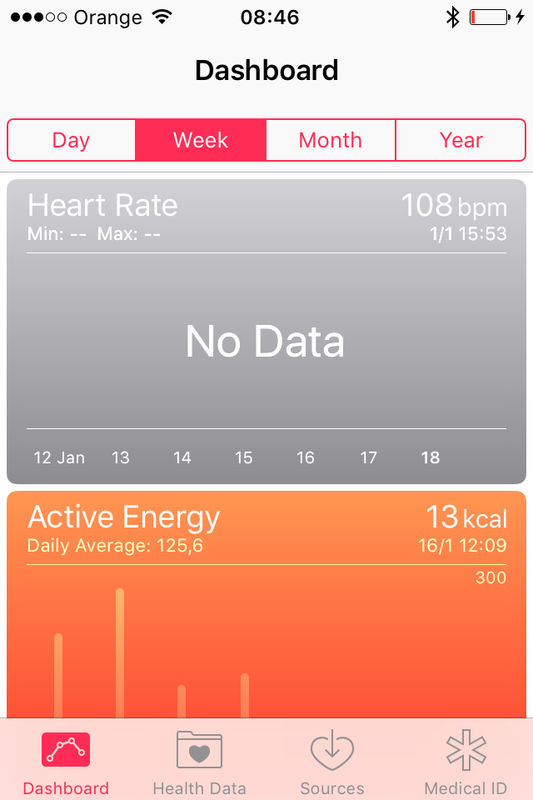 Before following all described steps, I have deleted all previous data on Apple Health Pulse. Thank you for your help, Jana. hi. i stickly followed the step, and with and without restart the device. there is not shown mi device at health source. but for endomodo it worked perfectly. thanks for the feedback. Let us know Your Apple Store e-mail to support@mimhr.com and we will enroll You to beta testing of new version of Mi HR that hopefully has good connection to Apple Health. will it work with Mi Band 2 ? I am using 5S with 9.3.2. When I tried connect with Mi Band 2 , All I got is green screen for a second then your software just close down. Mi Band 2 support is in Beta. Should be available in Appstore in few days. I just upgraded from mi band 1s to mi band 2 and I no longer can feed live heart rate from MI HR app to Health app and further to Nike+Running app on iOS 9.3.2, iPhone 5. On „6. Bluetooth on, waiting to connect” – mi band 2 does not connect on this step. Restarting does not help. The problem seems to be related the fact that Mi Band 2 does not appear in the list of source devices in Health app, unlike mi band s1. I also noticed that, unlike mi band 1s, mi band 2 does not appear in the list of My Devices in iOS Bluetooth settings WHEN native „Mi Fit” app is off/closed. Also I figured that mi band 2 cannot be found by iOS when searching for bluetooth devices – iPhone just does not detect mi band 2, „Mi Fit” is only the way to detect and pair with mi band 2. Please advice how to feed live HR to Health and Nike+Running apps. thanks for Your interest in MiHR app and for finding the way to connect in to Nike+Running app. It is important that Your experience is shared among other uses. Regarding Your question: we are working on good Apple Health connection. We will inform You when it is done. Just got Mi Band 2, paired with iPhone 6s running iOS 9.3.4. 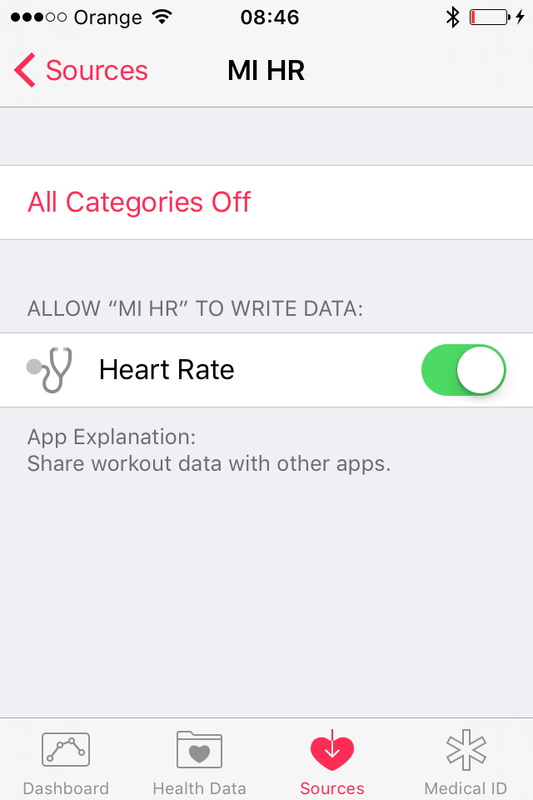 Continuous HR works in MI HR but will not sync data to Apple Health. 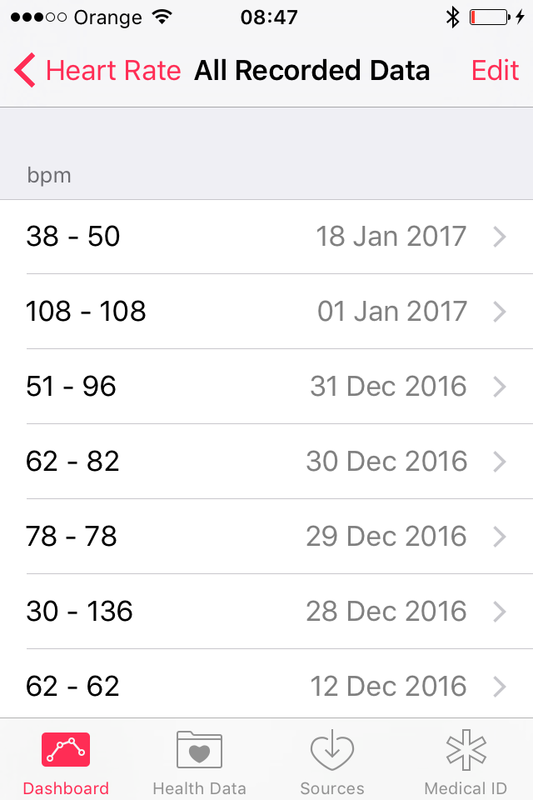 Apple Health does get data from Mi Fit for manual HR check though. 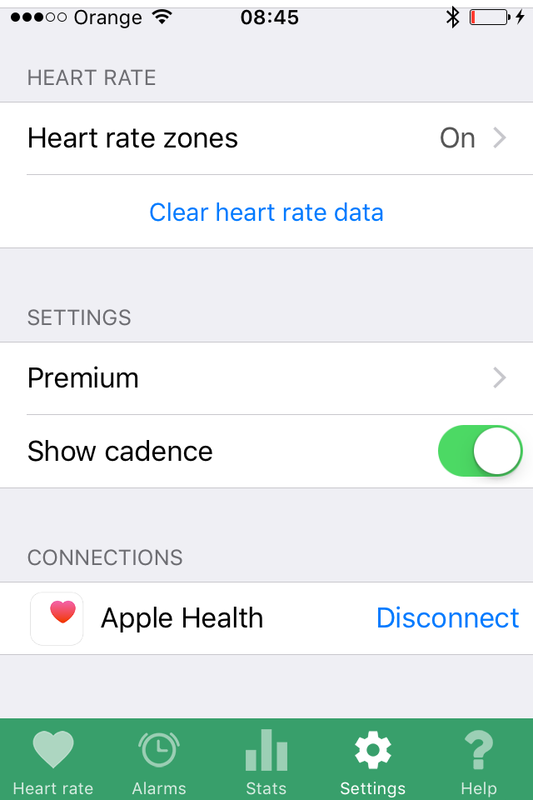 So I paid for Premium to get continuous HR but it is useless for me because I cannot get the data in Apple Health when I go for exercise. Hopefully you will be able to make that work soon. thanks for using MiHR and for supporting its development. we work on good Apple Health connection and need some time in order to do it. I would ask You for patience. We work on it. I hope we will fix it soon. I would love to buy the premium version if sync of continuous HR with Iphone 5S 9.3.4 mi band 2 and apple health would work. Please keep me posted about the fix. thanks for Your interest in MiHR. Yes, we work on it and I will let You know when it is possible. update: new MiHR version with good Apple Health Kit connection is available in Apple AppStore. please let me know whether You tried it and whether it works fine for You. is there a way to change in the continuous the sampling time , or a scheduler ? The possibility to measure Your heart rate at the selected by You frequency on iPhone is on the feature list. I will let You know there when it is possible. do You mean by changing the sampling or schedule time the above possibility to set measurement frequency? i start the mihr and send a vibration alert to check the connectivity . i think that there is high variation in the miband hardware to use it for intensive activity. thanks for the feedback. Did I understand You correctly: „schedule time” – You mean the possibility to set the time when You wish the measurement to take place (e.g. in 2 hours)? The possibility not to have abviously incorrect hr data in health app is on the feature list. If You have future comments, let me know. Something else , if i go away from the phone and the connection is lost is there a way to reconnect automatically . In the night i went to drink a glass of water and if i m not taking the phone with me , the connection will be lost and no data will be added to the app .